Joensuu is a city and municipality in North Karelia in the province of Eastern Finland. 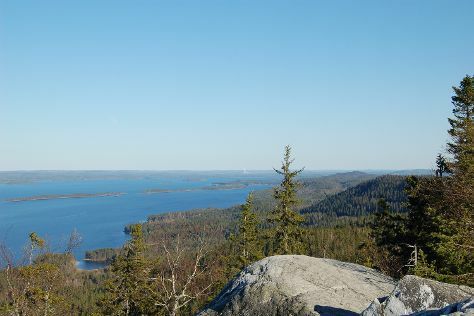 Change things up with these side-trips from Joensuu: Lusto - The Finnish Forest Museum (in Punkaharju), Koli National Park (Pielinen & Ukko-Koli Hill) and The Parikkala Sculpture Park (in Parikkala). There's much more to do: admire the natural beauty at Botania - Botanical Garden and Tropical Butterfly Garden, contemplate in the serene atmosphere at Kerimaki Church, test your team's savvy at popular escape rooms, and examine the collection at Kuopion Korttelimuseo. To find ratings, photos, maps, and more tourist information, read Joensuu day trip tool . April in Joensuu sees daily highs of 6°C and lows of -2°C at night. Cap off your sightseeing on the 20th (Sat) early enough to travel back home.